Miami Trace senior Jacob Batson, left, puts up a shot over McClain junior Dakotah Duncan during an SCOL game at Miami Trace High School Tuesday, Feb. 7, 2017. The Miami Trace Panthers clinched at least a share of the final South Central Ohio League basketball title with a 64-37 win over the visiting Tigers of McClain High School Tuesday night. Miami Trace improves to 11-1 in the SCOL, 16-3 overall. McClain falls to 3-9 in the SCOL, 6-13 overall. Ten different players scored for the Panthers, led by junior Cameron Carter with 15 points. He hit two of Miami Trace’s 10 three-point baskets. Junior Darby Tyree scored 13, including three three-pointers. Senior Jacob Batson scored seven, including two three-pointers; senior Keondrick Bryant had six points and senior Skyler McDonald hit a pair of threes for six points. McClain was led by senior Jacob Starkey with 16 points. Starkey and teammate, junior Landree Gray, were the game’s leading rebounders, each with eight. Starkey had a slam dunk for the Tigers late in the second quarter. McClain won the battle of the boards, 37-30, including 17 offensive rebounds. However, for McClain, a cold shooting night eroded some of the effectiveness of the fine rebounding. The Tigers hit 15 of 55 shots for just 27 percent. From three-point range, McClain was 4 of 21 for 19 percent. The Panthers were 25 of 53 from the floor for 47 percent and hit 10 of 25 three-point attempts for 40 percent. Another key stat: McClain had 21 turnovers to 12 for the Panthers. The Panthers jumped out to an 8-0 lead over McClain. At the end of the first quarter, Miami Trace held a 19-8 lead over the Tigers. McClain pulled to within nine points early in the second quarter, but by the half, the Panthers were in front, 35-17. The third quarter was the closest of the game, going to the Panthers, 10-8 for a 45-25 lead after three. Miami Trace won the fourth quarter, emptying their bench late, 19-12 for the 64-37 final. “We have nine seniors wrapping up their tenure here as players,” Panthers’ head coach Rob Pittser said. “They’re so interchangeable; they all do different things well that we could mix it up every night. “We wanted to focus on setting the tone tonight,” Pittser said. “We wanted to get a lead and build it. I thought we did that tonight. “Our ball movement against the zone was really exceptional, the best it’s been all year,” Pittser said. “With the ball movement and the shooting, they didn’t have any choice but to come out of the zone and match-up and that plays into our hands, as well. “These kids know that we have to be ready for any type of opponent in terms of team chemistry,” Pittser said. “We have to be ready to go against zone or man defense if we’re going to do something special as we end the season and prepare for the tournament. “We just didn’t make shots,” McClain head coach Jesse Mitchell said. “You have to take open shots against them, we just didn’t knock them down. McClain is at Clinton-Massie Friday. MIAMI TRACE — Cameron Carter 3 (2)-3-15; Darby Tyree 2 (3)-0-13; Jacob Batson 0 (2)-1-7; Keondrick Bryant 3-0-6; Skyler McDonald 0 (2)-0-6; Blake Pittser 1 (1)-0-5; DeAndre Pettiford 2-0-4; Mitchell Creamer 2-0-4; Tiante Connell 1-0-2; Seth Leach 1-0-2; Heath Cockerill 0-0-0; Brett Lewis 0-0-0. TOTALS — 15 (10)-4-64. Free throw shooting: 4 of 7 for 57 percent. Three-point field goals: Tyree, 3; Carter, 2; Batson, 2; McDonald, 2; Pittser. Combined field goal shooting: 25 of 53 for 47 percent. Three-point field goal shooting: 10 of 25 for 40 percent. Rebounds: 30 (7 offensive). Assists: 11. Steals: 11. Blocks: 5. Turnovers: 12. Personal fouls: 10. Bench points: 40. Second chance points; 12. Points off turnovers: 12. McCLAIN — Jacob Starkey 7-2-16; Brock Dean 0 (2)-0-6; Landree Gray 2-1-5; Mat Barton 0 (1)-0-3; Jensen Knaff 0 (1)-0-3; Dalton Mischal 1-0-2; Bryson Rickman 1-0-2; Owen O’Connor 0-0-0; Jay Beatty 0-0-0; Dakotah Duncan 0-0-0; Justin Osborne 0-0-0. TOTALS — 11 (4)-3-37. Free throw shooting: 3 of 5 for 60 percent. Three-point field goals: Dean, 2; Barton, Knaff. Combined field goal shooting: 15 of 55 for 27 percent. Three-point field goal shooting: 4 of 21 for 19 percent. Rebounds: 37 (17 offensive). Assists: 5. Steals: 3. Blocks: 0. Turnovers: 21. Personal fouls: 7. Bench points: 11. Second chance points: 9. Points off turnovers: 0. In the j-v game Tuesday, McClain edged Miami Trace, 28-26. Kobe Penwell was the game’s leading scorer for McClain with 10 points. Dakota Irvin and David Jett both scored six, Devin Carter had four and Ethan Cockerill scored two. For the Panthers, Austin Brown led with eight points. Austin Mathews scored six points, Drew Batson had five (including one three-point field goal), Dakota Bolton had three points (a three-point basket) and Jake Atwood and Tyler Eggleton both scored two points. In the freshman game, McClain won, 37-33. 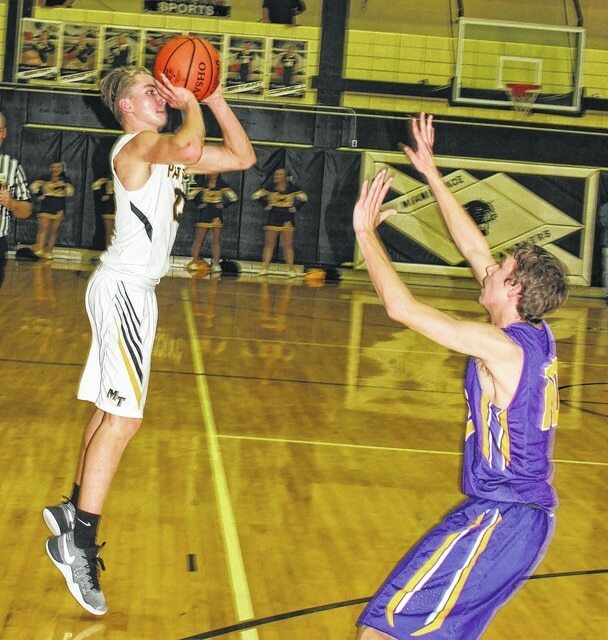 Cody Brightman was the game’s leading scorer for the Panthers with 16 points. He hit three three-point buckets. Trevor Barker had nine for the Panthers, Caleb Perry and Kyler Conn both scored three points (Conn hit a three-point basket) and Jacob Hoppes scored two. For McClain, Dillon Godfrey led with 14 points. He hit one three-point shot. Sammy Gruber scored nine, Preston Anderson had five (including one three-pointer), Hunter Hice hit one three, Dakota Bland and Teiryn Deaton both added two points.